The Africa Regional Data Cube (ARDC) was formally launched 9-11 May 2018, at a high-level event in Nairobi, Kenya. ARDC is a new tool that harnesses processes in the latest Earth observation and satellite technology to help Kenya, Senegal, Sierra Leone, Ghana, and Tanzania address food security as well as issues relating to agriculture, deforestation, and water access. The ARDC is based on the Open Data Cube (ODC) infrastructure, which has been successfully demonstrated in Australia, Switzerland and Colombia and is under development or evaluation by more than 35 other countries. The ODC allows analysis-ready satellite data (e.g. Landsat, Sentinel, etc.) to be spatially and temporally aligned in "cubes" of pixels. These data cubes, hosted in the cloud, allow efficient time series analyses (e.g., land change, water extent and quality, agriculture extent and health), permit the use of diverse datasets via interoperable methods, and support connections to common analysis tools while reducing the data preparation and management burden on users. In addition, the ODC community allows engagement of other global users to develop new core code, share algorithms and provide support for the resolution of problems. 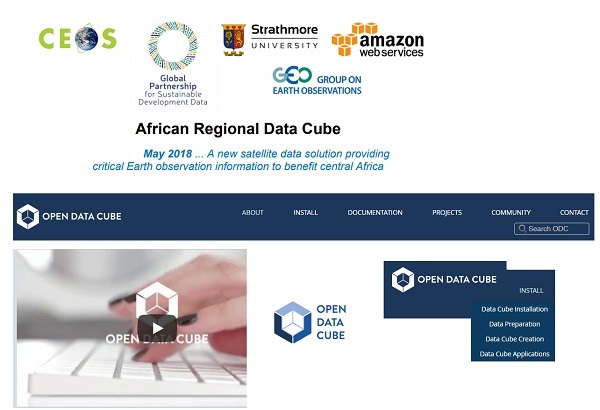 The ARDC data cube was developed by the Committee on Earth Observation Satellites (CEOS) in partnership with the Group on Earth Observations (GEO) , Amazon Web Services, Office of the Deputy President – Kenya, Strathmore University in Kenya, and the Global Partnership for Sustainable Development Data. To keep up-to-date with AIMS news, please, Sign up for AIMS Newsletter, follow @AIMS_Community on Twitter. And, thanks again for your interest !